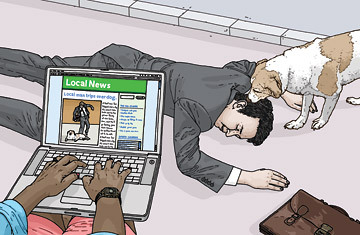 Are Hyperlocal News Sites Replacing Newspapers? All politics may be local, but apparently not enough journalism is. As newspapers keep cutting back on staff and printing skimpier editions, journalists, entrepreneurs and ordinary citizens have responded by creating websites to cover the local news they feel is going underreported  like the serious windstorm that hit Tracy Record's Seattle neighborhood in 2006. "Every day we break stories," says Record, the editor and primary reporter for West Seattle Blog, a site she and her husband created as an information hub after the storm. "In the past hour, I learned a major parks project is being delayed because of drainage trouble and just broke that on our site." She also covers car crashes, crime, council meetings, bake sales and walkathons for the 70,000 or so Seattle residents who live west of the Duwamish River. "If they were able to get the local news they needed elsewhere, we wouldn't have wound up doing this," says Record. Hyperlocal has become a buzzword as familiar to news junkies as eat local is to foodies. The idea is to get residents involved in the reporting not just by sending in tips but by writing content about important local issues such as school boards and transportation. In professional newsrooms, "we spend too much time on craft and not enough time on community," says Michele McLellan, a fellow at the Reynolds Journalism Institute at the University of Missouri who spent the past year studying nearly 70 of the best hyperlocal sites. "Many of the new sites, even if they don't have the most polished reports, are flipping that: community first." McLellan, who will present her findings in September at the Block by Block: Community News Summit 2010 in Chicago, concluded that 1 in 10 hyperlocal sites is producing "good" content, some good enough to give traditional journalism a run for its money  sometimes literally. After years of relying on donation drives to keep going, Record's West Seattle Blog made six figures in revenue last year before taxes; the same is expected for 2010. Sensing the potential of niche news, the Knight Foundation, a nonprofit journalism organization, has given out roughly $20 million in grants since 2006 to help nurture the most promising sites. Last August, msnbc.com bought EveryBlock, which posts public records and news searchable by ZIP code in 16 cities. And in March, AOL announced plans to invest up to $50 million in local initiatives like Patch, which provides community-specific news in 65 towns and expects to service hundreds more by the end of this year. Megasites like EveryBlock are also pushing the boundaries of hyperlocal. EveryBlock runs individual community sites from its headquarters in Chicago and populates them mostly with publicly available data such as crime reports, building permits and restaurant inspections. "Many journalists would say good journalism is about good storytelling," says EveryBlock founder and former WashingtonPost.com editor Adrian Holovaty. "As much as I love a compelling story, I think good journalism can also be about organizing information in intelligent ways and giving people tools that let them help each other." See the 50 best websites of 2009. See YouTube's 50 best videos.